She got da mooves, too! A brilliant move by Hillary to change the subject set the record straight! Give that woman a cigar! As opposed to setting the record ghey? 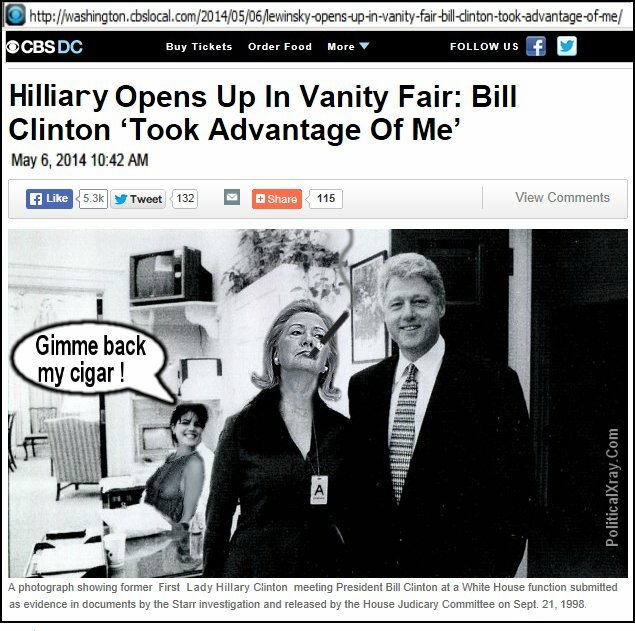 Monica to Hillary: Gimme back my cigar ! WHAT IS THIS "BENGHAZI"? IT IS NOTHING MORE THAN ANOTHER SMEAR KAMPAIGN BY THE KAPITALIST "TEA 'PARTY'" TO DEIGN AND DESTROY OUT MOTHER OF THE MOTHERLAND, KOMRADE HILARY! IT WILL FAIL!!! KOMRADE HILARY HELPED OUR GLORIOUS, UNDEFEATED, AND UNBROKEN LEADER, THE WONDROUS BARAKK OBAMA!!! LONG LIVE THE GLORIOUS LEADER!!! LONG LIVE THE MOTHER OF THE MOTHERLAND, KOMRADE KLINTON!!! Hillary Clinton's Rube Goldberg/Benghazi Flu update! Rube Goldberg/Benghazi Disease Strikes Hillary Clinton!